No. 2 The Right “Lifestyle” Fullback. Purpose: Provide your team with the diet, exercise and rest it needs to play well. Out of homage to my patients and great respect to a legendary footballer, please allow me to make a deviation from my WBA eleven, by naming Sir Stanley Matthews, in my all star – Team for Life. Admittedly, out of position, but undoubtedly out of this world as a player, Sir Stan possessed the skill, pace, intelligence and stamina to have been the ultimate wing back in today’s modern game. Heaven only knows what his value would have been in the current transfer market, but in terms of Premiership Health, the right lifestyle is invaluable! The oldest player ever to represent England at 42, he became the only footballer in history to be knighted whilst still playing, until finally hanging up his boots at the ripe old age of 50. No wonder his name is synonymous with longevity, style and panache. The son of a butcher, it was inevitable that he would remain as fit as the proverbial butcher’s dog throughout his prestigious career. As meticulous with his diet and exercise as he was with his pinpoint passing, his love and enthusiasm for the game never wained. He demonstrated great discipline, both on and off the pitch, never booked or sent off as a player, he refrained from cigarettes and alcohol for the duration of his life, except when drinking champagne from the FA cup trophy celebrating his famous victory in the “Matthews Final” of 1953. So great was his contribution in this game, it was named after him, rather than another Stan, Stan Mortensen, who became the only player to score a hatrick in an FA cup final. 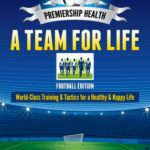 Matthews was the catalyst for a great comeback, from 3-1 down to 4-3 victors, he set up two of the goals and became the game changer in the match, just as the right Lifestyle can become the game changer for your health. Every Monday he would forego food altogether, and drink eight pints of water to flush his system out, then when it came to training he would wear weighted boots on his feet and play in the lightest footwear he could find to maximise his speed and acceleration.